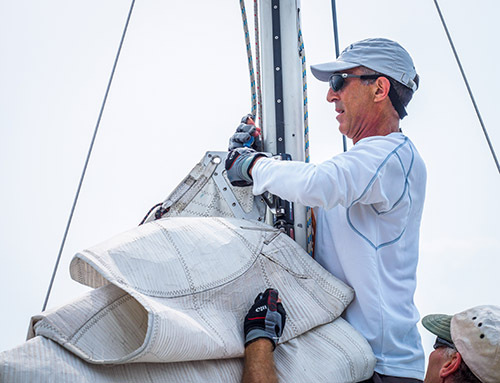 The crazy-windy 2016 Chicago to Mac was tossing our J/130 around like a toy when the helmsman (no, not me) made a bit of a mistake—the huge, green spinnaker suddenly wrapping around the headstay, wind blasts threatening to rip the spinnaker to bits. Raining, dead dark, we call for Bill. Bill Gladstone. He pokes his head up from below and calmly goes to work, unflappable despite the roar of the flapping sail, asking for a couple jibes to unwrap the sail and minutes later we’re back on course, sail intact. This was Bill’s 28th Chicago to Mac, so he’s seen a lot of nutty stuff on Lake Michigan and lots of other places. 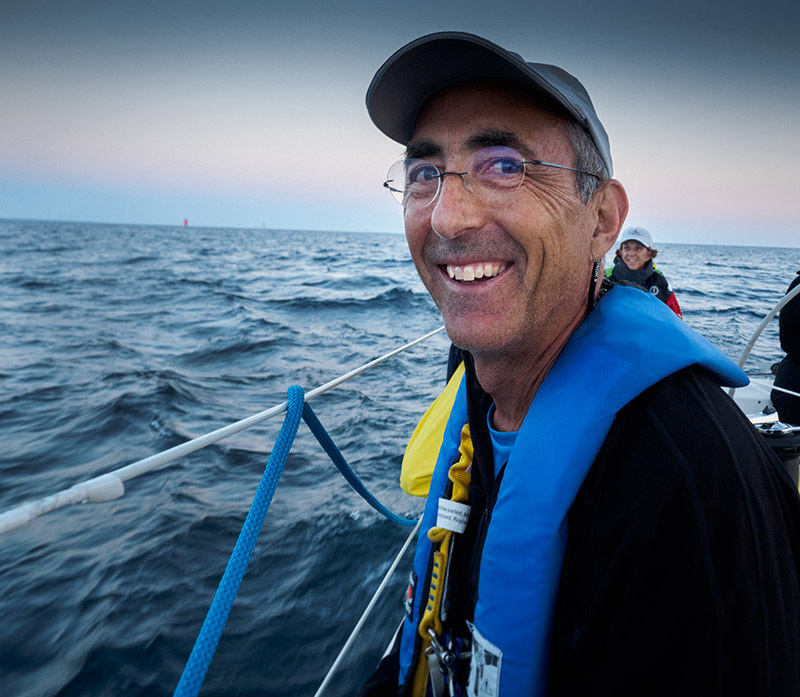 He takes it all in calmly, with a smile and a laugh that help explain how he’s been able to take teaching performance sailing and turn it into a lifetime vocation. His business is North U, which presents seminars each year around the country plus the Regatta Experience and clinics in Ontario, Captiva Island, Florida, and St. Thomas. In October, Bill will offer AYC a short version of one of his workshops, spinning stories as he suggests tactics, rules, and trim. Expect to be as much entertained as informed. The meeting is Tuesday, October 10, beginning at 7pm (but arrive early for dinner). Monthly meetings are held at the Caddy Shack @ Rolling Hills Golf Course, 1415 North Mill Avenue, Tempe, AZ 85281-1205 (map) and both members and non-members are welcome to attend. Bill’s racing experience covers the spectrum, including everything from dinghies to Maxies, ponds to oceans, and foredeck to helm. He has finished in the money at Key West Race Week, the SORC, Block Island Race Week, Chicago NOOD, Annapolis to Newport; Chicago to Mackinac, the Annapolis Fall Series, NYYC Race Week, and Queen’s Cup. Bill raced collegiately for Yale and was founder of the Chicago Sailing Club. He’s been teaching sailing and racing for over forty years. Graduates of his seminars number in the thousands, including several dozen AYC members.